Add about 4 Tablespoon peanut oil to the wok and turn the flame on high heat. When the oil is almost smoking, add the chicken strips and push around vigorously with a wok spoon or spatula. When the chicken seems as if it is starting to brown, push it up the side of the wok and crack the eggs into the wok. Stir the eggs around a bit. When almost fully scrambled, mix in the chicken and stir around for 30 seconds more. Push the eggs/chicken to the side, add oil, and throw in the tomato and onion. Stir-fry for about 5 minutes. Add the cold cooked rice and mix it all in. Turn the heat down and then throw a few splashes of nam pla and soy sauce on to taste. Add about a tablespoon of sugar, a teaspoon of salt, a splash of vinegar, and two tablespoons of chilli sauce and garlic. Stir it all in and turn off the heat. 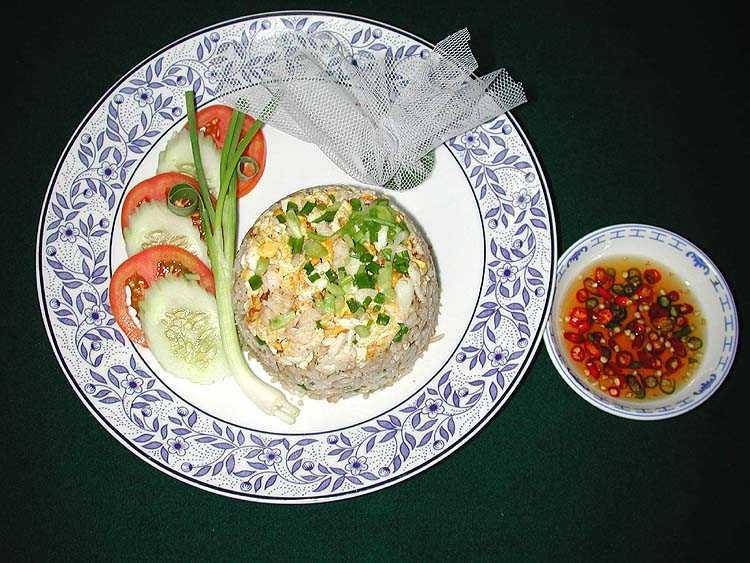 On a large platter, arrange the garnishes on a lettuce leaf, and plate the fried rice next to it.